Located in Acheson Industrial Park, just west of Edmonton, this 12,000 sqft. 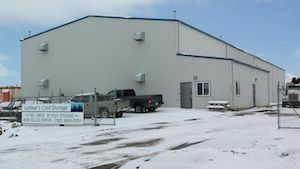 facility was built by Brad & Larry Lafleur in 2001 and is still operated by Larry Lafleur who has over 35 years experience in the growing and storage of tree seedlings. Lafleur's Cold Storage has a proud reputation of providing quality seedling storage and service. The experienced staff and management at Lafleur's Cold Storage will continue to insure excellent freezer storage for the tree seedlings that will become Alberta's future forests.